Does LED matrix scanning reduce overall brightness? Such that only one row is powered ON at any given time, would this cause a reduction in LED brightness? 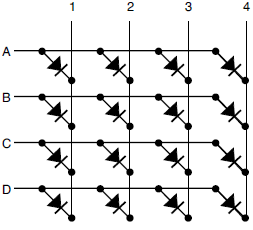 My rationale is: In this 4x4 matrix, row 1 will only be turned on 25% of the time. This seems awfully similar to PWM control, which is also a common method of controlling LED brightness. In this example, would all the LEDs be operating at 25% of their maximum brightness? Yes, if the LED current remains the same, then scanning will reduce the duty cycle and the amount of light. You can offset this by increasing the LED current. But, you need to watch out for the LED current ratings (continuous and pulsed), of course. 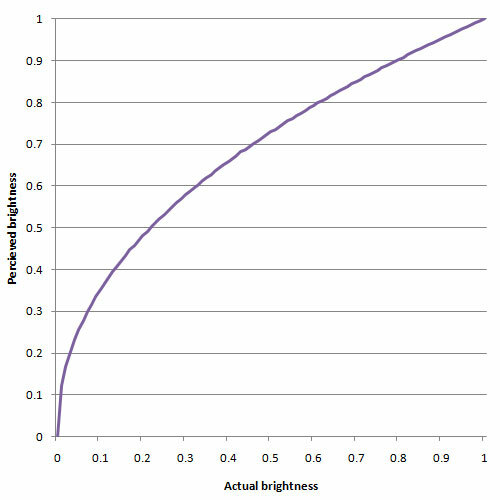 As an aside, keep in mind that human perception of the brightness is a nonlinear function of light output. Yep, the maximum duty cycle goes with the inverse of the number of groups that get cycled through. This can be compensated for to some extent by increasing the drive current, but then you may have to take some precautions to ensure that the LEDs do not get damaged if they are accidentally run at 100% duty cycle at the increased current. I picked up an LED matrix assembly a while back that has integrated drive electronics (decoders and shift registers) and it actually includes a timer component that limits the length of the enable pulse so that it's difficult to leave one row illuminated indefinitely. Yes, LED's brightness depend on the current supplied; the bigger the array, the more current you will need otherwise brightness with decrease. Not the answer you're looking for? Browse other questions tagged pwm led-matrix or ask your own question. RGB LED matrix power too low?